When scrolling through the Facebook News Feed, the video play automatically when it’s on the screen, without or with sound accompanying the video playback. 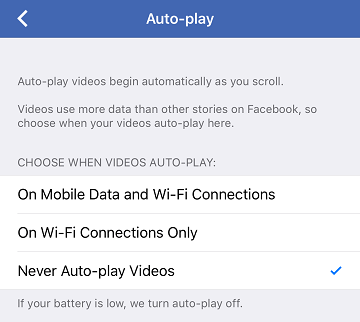 The autoplay of videos in the Facebook News Feed uses the precious mobile data allowance of your phone plan. In additon, it also potentially drains the battery faster. In any cases, if you’re interested in the video, it’s pretty simple, easy and straightforward to tap on the video to playback and watch the video. Login to Facebook.com in a web browser. 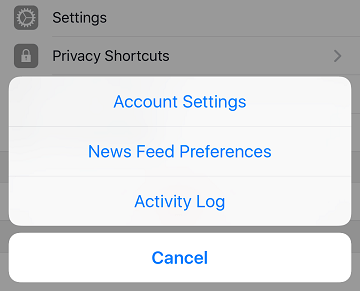 From the top right of Facebook, click on “Down Arrow” and select Settings. On the left menu pane, select Videos. In the Auto-Play Videos section, select Off from the drop down menu.